I’d like to introduce you to Carole Lipari. She’s the founder and leader of AXIS, a Cru ministry on the campus of the University of Arizona. Carole, what’s the idea behind AXIS? 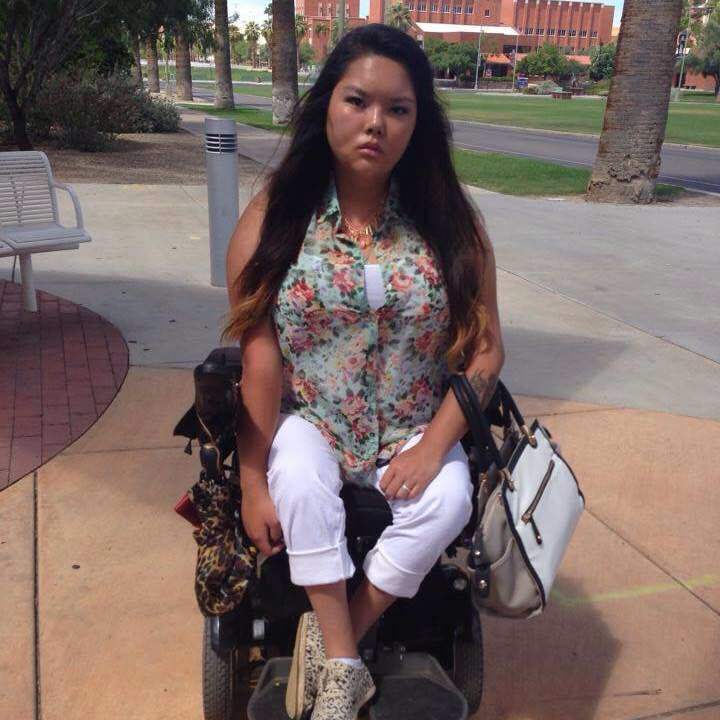 AXIS is the first ministry designed for students who have physical disabilities at The University of Arizona. This is a co-ed Growth Group where we can connect with one another through our experiences with disability, but grow in this community to find our greater identity in Christ. I am a 22 year old student at The University of Arizona. I love dogs, connecting with people, and anything that will give me a good laugh. When I was seven, I was diagnosed with an extremely rare disease called Infantile Facioscapulohumeral Muscular Dystrophy. This progressive disease meant that I would be powerchair bound for the remainder of my life, facing its physical and emotional obstacles. It meant that I would be unable to make any facial expressions—smiling, frowning, smirking at my siblings when they annoy me, etc. Some days, the reality of disability discourages me. But if there is anything that I have learned from my twenty-two years on the planet, it is that there is power in optimism, and there is freedom in laughter. After all, I will never have wrinkles on my face, and perhaps someday I will become one of those millionaire televised poker players. I am also one of four adopted children from Korea. I was blessed with an incredible family and an even more incredible mother. I hail from the great city of Chicago, but traveled across the country to study English, Creative Writing, and Film and Television Production at The University of Arizona. I have a heart for people, and specifically a heart for evangelism within the disability community. ReachGlobal, with whom I serve in Europe, has historically been a church-planting mission, strong in evangelism. We are using the term “gospel initiative” a lot nowadays to describe what we are looking to see happen. What we mean by that is “A strategic, ongoing effort by your team or partners to make the gospel known in both word and action resulting in the transformation of lives and communities.” Now as I’ve heard about what you’ve been doing with AXIS and other things to do what you call “engaging disability culture,” I see a lot of similarities. So let’s start with the idea of “disability culture” – Can you explain what that is? And disability culture describes the ways in which these people can share what’s important to each other in order to support people as they go through life. So if you have a disability, that creates certain needs for you, you would benefit from connecting with a group that understands you and could support you in seeing that those needs get met. So you’re saying a defining factor is a shared characteristic. But it seems like it’s more than that: doesn’t it connect with one’s perceived self-identity – whether they embrace their impairment as “a part of who they are” or whether they deny they ARE impaired? Sure. There is a whole spectrum of ways in which people identify themselves in relation to their disability. On the one end of the spectrum, there is the person who says “I’m just like everyone else. I’m not gonna let this “disability” stand in my way. It doesn’t define who I am.” The other end is the person who draws his or her identity from disability. If this person were asked if he or she would ever give up the disability, this person would likely say no. Right now, I locate myself somewhere in the middle. Totally. One thing that has helped me is the leadership development I’ve gotten with CRU. I think it’s important to understand the role of Christian leadership. It made a great difference to me that I could be a leader, become a GREAT leader, without having to either ignore my disability or totally allow it to define who I am. So what makes disability culture an actual culture and not just a collection of differently abled persons? One thing that definitely is important is the unique level and kind of understanding that only another person who knows what it is to live with a disability when and where you do can give you. I think that, as a collection of people, a certain sort of activism comes out. It arises out of a concern for peoples’ rights. In the general population, that doesn’t always get heard a lot, but within the disability culture it’s part of everyday life. Basically, you could say that we all share a common sense of being oppressed. Whether or not you’re an activist or how you see yourself in relation to your disability, this reality is all-encompassing. No matter how much you might want to go through the day without even trying to think about having a disability, it’s there. And certainly, not everyone can understand that. But these people do. They understand and value the need to give support for these sorts of things… and they actually GIVE that support. So there is a shared experience that can be a very powerful bond between those who hold it in common. But, you didn’t feel that need at first. It seems like you were trying to build on your strengths to make your disability irrelevant. That people would just see Carole and not whether or not you used a wheelchair. This is where God really rocked my world. He broke my heart for these people. I saw that he’d given me a unique ability to connect with other students with disabilities. I saw I had a gift for connecting, articulating the gospel to them, and communicating why the gospel matters. It’s funny, because it’s like it was not the plan I wanted to pursue. I did not want to be “the wheelchair person” – which was exactly what everyone expected me to be. This is not about pity, or even compassion. It’s not about feeling sorry for the poor “disabled” person who needs someone to help them. It’s about connecting with them in order to share the gospel… because they need it too, just as much as anyone else, and they need it as a group as much as any other group you could single out. It sounds like something of an “all nations” approach to disabilities. So you really see them as a “people group”… that among all the “tongues, tribes and nations” around the throne of the Lamb, that there will be folks who share the experience of what it means to live with disability? Yes. A lot of disability rights activists talk about access and accessibility. I just think it’s about access to the Gospel. We are called to see that every group in which people live has a gospel witness. So it’s a response to the Great Commission, it’s not anything that’s extended out of pity or anything. I do believe that we truly are a particular people group. The thing is that, unlike other, say, ethnic groups, they are to some degree geographically defined. But we, those representing disability, are everywhere. There’s nowhere on the face of the earth that we don’t exist. But we are rarely seen or understood as a unified people group. What advice would you give someone like myself who wants to connect with disabled people, to express value for the things you’re describing? Are there things I need to know about disability culture that will help, or do I just need to connect with everyone as an individual? Well, there’s not an easy answer. As an example, I don’t know how many times I’ve had people come up to me and ask me questions like “Can you race that thing? Can you do wheelies?” Those questions, though they may be perceived as funny, are actually quite insensitive. It is insensitive because it is pointing out the obvious conclusion that I am different. If people thought a little bit about what it meant to go through every day of life with a disability, they would know that it’s not funny. But they just think about themselves – as who they are right now – sitting in the chair and they’re not able to get the whole picture. But it will never be enough to give people a list of what to say and what not to say to a “disabled” person. That’s never going to work. You need to know people, know what it means for them to trust you and work to see it happen. The light bulb goes off when an able bodied person has a genuine relationship with the person who has the disability. They then witness a stranger asking such an ignorant question so blatantly. They then understand why it is so painful to be treated like a specimen. They then choose to not say such things. Sometimes, they will even speak up. That is how we will change the world. But the first step must be to love and foster a genuine relationship. Check back tomorrow for the second part of this interview where we talk about gospel initiatives. Previous Post Why are leaders from a church planting mission in Europe attending a conference on disability in L.A.?